I am always on the lookout for special bits and pieces and being the hoarder i am, i am not fussy what it is! I am known for repurposing everything- the ultimate recycler!!! A lovely lady waited to see me for ages on Saturday with a small, brown old school case but what she pulled out was a delight! 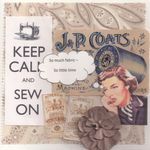 Superb blank cards with all sorts of vintage touches, old tape measures, buttons, verse, paper tops of cotton reels, old paper needle packets. Not just a sewing theme, some for guys with old postage stamps, old beer bottle labels and newspaper clippings. The nicest i have seen and would be lovely framed in some old wood picture frames for the sewing room so would make a nice addition for the sewer or quilter as a gift.